Building a bird house may seem like an easy project, but there is much more to an attractive, bird-friendly house than a wooden box with an entrance hole. Before you build a bird house, you need to understand what nesting birds need and how best to meet those needs with the house you construct. To build the best bird house, you first need to learn what cavity-nesting birds are frequent visitors in your region. These are the birds most likely to investigate your house, and when you keep their needs in mind, you can build a bird house to invite them to become more permanent residents. A bird house doesn't need to be complicated, but if you haven't built one before, it is best to start with a tried-and-true plan. There are many free bird house plans available online with styles and designs suitable for beginning woodworkers to experienced architects, or you can buy a book of bird house plans for a hard copy reference. If you are an confident woodworker with some building experience, you may even feel comfortable designing your own bird house with the information you've learned about what nesting birds want. If you are a novice, however, building a bird house from scratch may seem too intimidating or ambitious, even with detailed plans. In that case, you may want to consider using a bird house kit with pre-cut pieces to assemble. Another option is to start with a simple bird house and make modifications to the design to make it more bird-friendly to suit the species you hope will take up residence. You can't build a good, safe bird house if you don't use the right tools for the construction. Be sure you have the proper drill bits, screwdrivers, hammers, saws and other tools for building bird houses on hand, and that those tools are in good working order. Reread instructional manuals if needed, and always practice proper safety when using different tools. If you are unfamiliar with the necessary tools, you might consider a beginning woodworking or wood shop class instead – building a bird house is often a class project you can select. This will allow you to build your first bird house with expert guidance to be sure you are building it correctly and using tools properly. Along with the tools you use, you also want to have the appropriate materials for the house. Most bird house plans will suggest the best material, or you can opt for slightly different materials you may already have on hand. 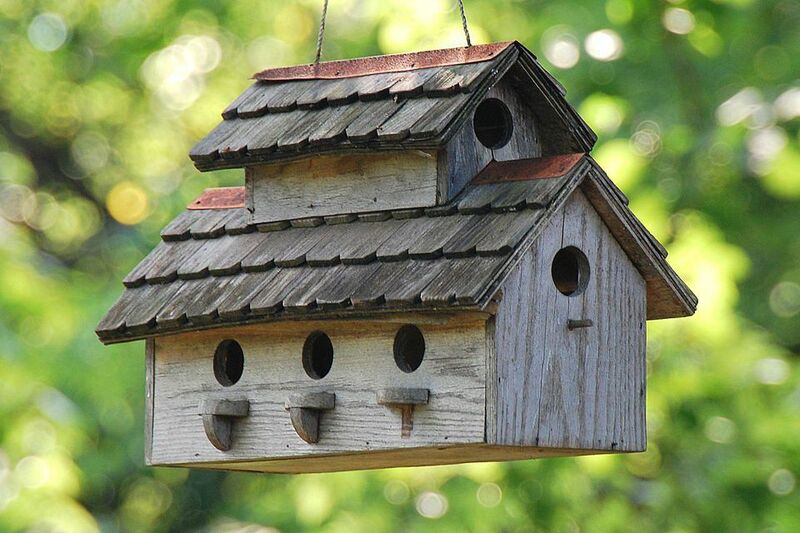 Recycled or upcycled materials are great for building bird houses, such as using parts of old fences, barns or other older, well-seasoned wood that birds will appreciate. Include ventilation holes to reduce heat and keep nestlings comfortable. Add drainage holes to remove waste and water and help with ventilation. Use a deep roof overhang or countersunk hole to keep rain out of the house. Choose only natural building materials. Untreated hardwood is best. Do not paint or varnish the house interior, which could be toxic. Choose natural exterior colors that blend with the surroundings for camouflage. Avoid houses with perches that make it easier for predators to reach nestlings. Include a hinged roof or side door that can be opened for seasonal cleaning. By understanding the key elements of a bird-friendly nesting spot before you build a bird house, you can be sure the house you create is safe, comfortable and attractive to birds. With a good house, you can enjoy generations of bird families nesting nearby and reap the rewards of being a responsible bird landlord.